Greyfriars is all that remains of an early Tudor friary church of the Franciscan order of monks. The Franciscans were often called 'Grey Friars' due to the colour of their robes. Greyfriars was founded in 1231 following a gift of land by Lord Berkeley (see Berkeley Castle). Henry III also gave support to Greyfriars in the form of oak trees from the Royal Forest of Dean, used in the construction of the monastic buildings. 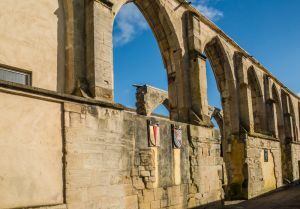 Henry, who was crowned in Gloucester, also supported the building of Blackfriars and Whitefriars in the city, so clearly he had a soft spot for the city. Greyfriars supported 40 mendicant monks. That is, the monks had all taken vows of poverty, and thus supported themselves by begging. 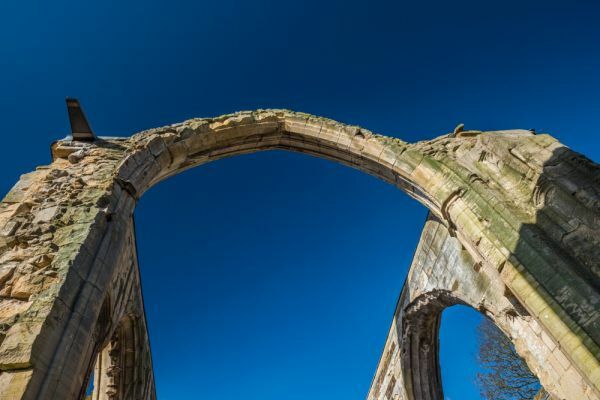 In 1285 the monks argued with neighbouring St Peter's Abbey over rights to a shared water supply. The squabble was eventually settled by Edward, the Black Prince, who decided in favour of Greyfriars. 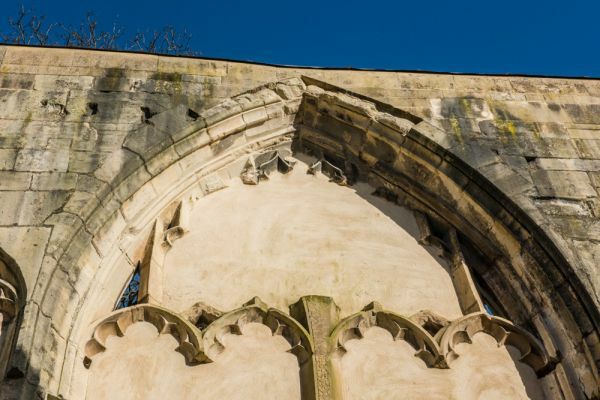 The friary church was rebuilt in 1518, once more with the aid of the Berkeley family. It is this church which forms the majority of the ruined buildings which we can see today. The friary dwindled in importance in the late medieval period, and by the time it was dissolved in 1538 there were only five friars left. 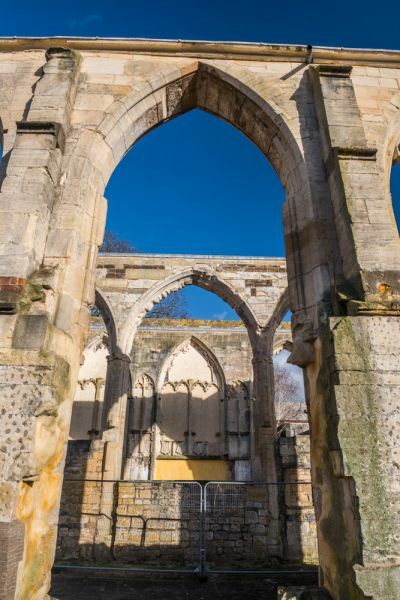 After the Dissolution, the friary church became a brewery, but the former monastic buildings were heavily damaged in the siege of Gloucester during the Civil War. 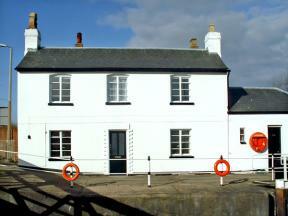 For a time parts of the buildings served as a dwelling house, a boarding house for seamen, shops, and a library. 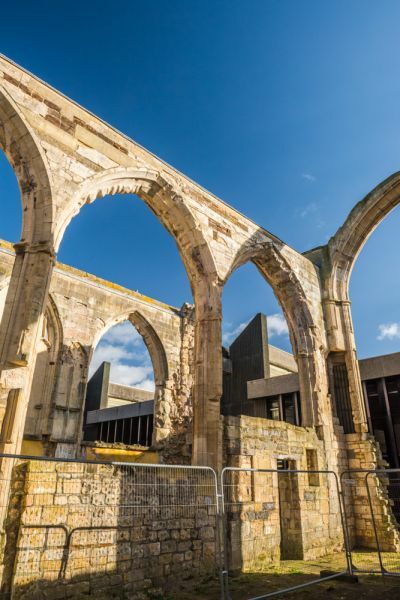 The monastic church is now in the care of English Heritage, and the site is open at any time. The major appeal here are surviving medieval windows, some decorated with heraldic shields. There are also painted coats of arms to important local families including Chandos and Clifford. 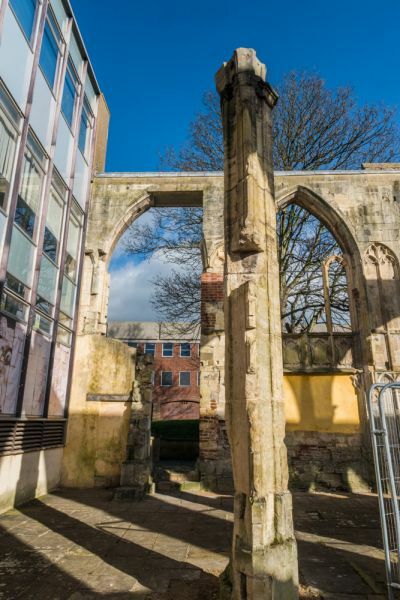 The friary ruins are on Greyfriars Walk, just around the corner from the city museum and art gallery, between Brunswick Road and Southgate Street. There are several pedestrian signs from Southgate Street and St Mary de Crypt church. The friary should take no more than 5 minutes to explore. As this is written the friary remains are undergoing restoration. We've visited several times. The first time there were fences around the entire structure and all we could do was look through the fences. The latest time we visited it was great to see that restoration had proceeded and we could enter the building, though some areas were still fenced for safety.